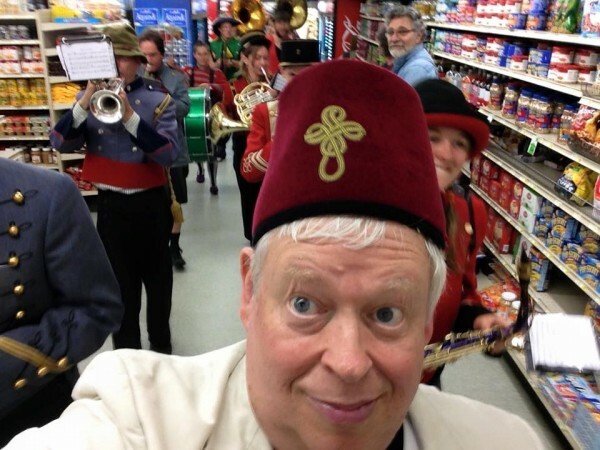 When the New Old Time Chautauqua marched into a TEDx talk in Seattle in 2012, there were jugglers, marching band musicians with mismatched uniforms, a saxophonist with a fez and a mustachioed ringmaster in a kilt. Now, the motley troupe of almost 60 performers and educators is in Juneau for three days of workshops, shows and activities that start Thursday. 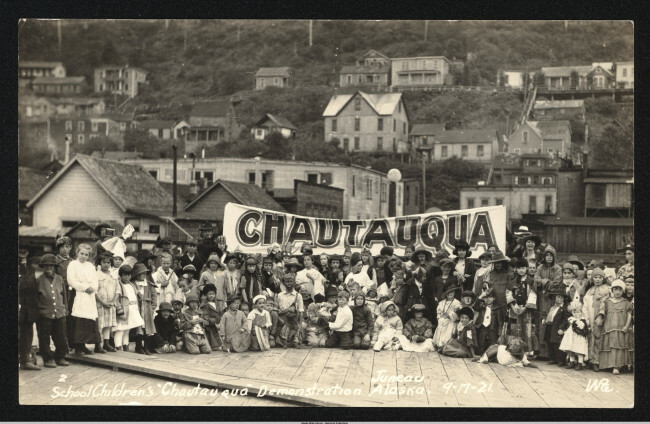 The traveling Chautauqua movement began on Lake Chautauqua in New York in the late 1800s. They brought lectures, theater and music to rural communities but it mostly died out after the rise of radio and motion pictures. In 1981, Patch Adams — yup, the one Robin Williams played — and the Flying Karamazov Brothers revived the movement. Natalee Rothaus was with the Juneau Arts and Humanities Council in 1992 when the New Old Time Chautauqua first visited Juneau. “It’s so much fun and it’s so much goodwill, spirited. You know, you’re working with people who are doing this for the love of it. They’re not coming in just to do a show. It’s not just a gig, it’s a Chautauquan family,” Rothaus says. 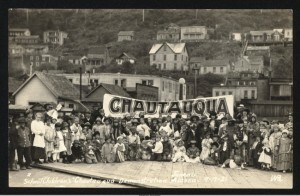 The New Old Time Chautauqua is a nonprofit whose members volunteer their time and fund their own travel during their month-long tour each summer. It’s Chautauquan tradition to share knowledge, partner with local organizations and build community through laughter, entertainment and education. “The last time we did do a parade, it was quite wonderful. I myself wanted to run away with the circus,” says Rothaus. So far on this jaunt, the group has performed in Ketchikan, Wrangell and Petersburg. 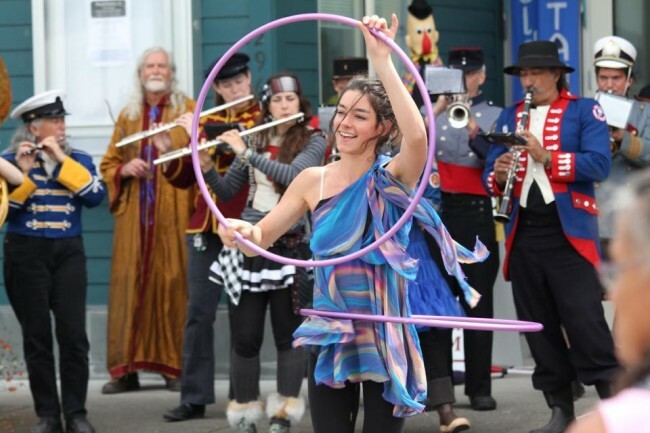 A New Old Time Chautauqua performer in the streets of Wrangell, June 26. Snyder is the only Alaskan from Southeast in the troupe. She plays violin, juggles, hula hoops, and contributes a little singing and dancing. “Just expect fun and warmth and friendship. We’re just here to entertain and put a smile on your face,” Snyder says. Their three-day routine begins with an open potluck Thursday at the Douglas library. Think of it as a Chautauqua launch party with a chalk drawing competition and community music jam. Friday is the workshop day at Centennial Hall, where the Chautauquans and community members will teach circus skills, how to build a fire using friction, the Chinese meditative art of Qigong, how to fold a fitted sheet, and lecture on health. There will also be pop-up performances downtown. The only ticketed part of their visit is their headlining vaudeville show Friday evening, which features music, aerialists, the Flying Karamazov Brothers and lots of shtick. On the Fourth of July, they’ll march in both the downtown Juneau and Douglas parades. New Old Time Chautauqua founder and original Flying Karamazov Brother Paul Magid hopes to inspire change person to person. The troupe will perform at the Johnson Youth Center and the Juneau Pioneer Home, too, as part of their service mission. After Juneau, they’re headed to Hoonah, Haines and Sitka. Full disclosure: All proceeds from Friday’s ticket sales benefit KTOO Public Media.